The AIR OPTIX® family of breathable* contact lenses lets you focus on your life, not your contact lenses. They provide clear vision and consistent comfort. Plus, the monthly replacement schedule is easyto remember. 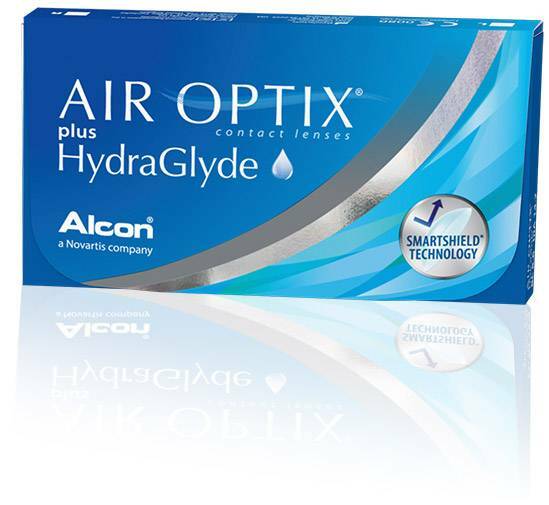 More specifically, AIR OPTIX® plus HydraGlyde® contact lenses bring together two advanced technologies designed to provide long-lasting lens surface moisture and deposit protection. SmartShield® Technology: Helps protect against irritating deposits all month long. HydraGlyde® Moisture Matrix: Attracts and maintains surface moisture on the lens through the end of the day. AIR OPTIX® plus HydraGlyde® contact lenses give you the freedom of contact lenses, with the comfort you’ve been missing. * They are a great solution for patients with an active lifestyle. These are the first and only contact lenses to feature two advanced technologies, SmartShield® Technology and HydraGlyde® Moisture Matrix, to help provide excellent deposit protection, and support long-lasting lens surface moisture. Your eye care professional can determine the contact lens and correction that are best for you—Come visit us today. *Based on clinical testing of AIR OPTIX® AQUA contact lenses. Important information for AIR OPTIX® plus HydraGlyde® (lotrafilcon B) contact lenses: For daily wear or extended wear up to 6 nights for near/far-sightedness. Risk of serious eye problems (i.e., corneal ulcer) is greater for extended wear. In rare cases, loss of vision may result. Side effects like discomfort, mild burning or stinging may occur.